On 8th September 2017 on the eighth day of my Mystical Circles blog tour, fellow-blogger Kerry Parsons published an article by me on her blog Chat About Books. This is the eighth in a series of blog posts in which I re-publish the articles on that blog tour. I was inspired to write Mystical Circles by, among other things, the challenge and the dual effect of family relationships; family relationships which seek to protect and encourage and advise, and which sometimes turn in a negative direction, when they may stultify and suffocate and control. I had an idea in my mind of an older sister shocked and horrified by a decision her impetuous young sister had made – a decision which could impact on the rest of her life, and which might lead her down a path the older sister thought destructive. So I began my tale of Juliet, a freelance journalist who has begun to establish herself well in life, horrified by unexpected news from younger sister Zoe, fresh out of university, no plans in mind for a career, who has been captivated by a new spiritual outlook – and a very seductive cult leader – or so it appears to Juliet. Of course, when a novelist sets out to create a story, real people influence fictional characters. And then those characters take off, and develop a mind of their own, and soon they are controlling the plot and driving the novelist along certain paths. I have long been fascinated by human personality and the ways in which different individuals interact with each other, either leaching energy from or building up those who they come into contract with. Likewise, the whole area of group dynamics is a source of inspiration for me. I have been in many different groups of people throughout my life – whether that be within a family gathering, an office environment, a structured workshop or psychological therapy group, or a new age spiritual group like the one portrayed in Mystical Circles – or, indeed, a writing workshop or conference. Another of my inspirations for Mystical Circles was an Arvon Foundation writing course I attended at Totleigh Barton farmhouse in Devon. I’ve been to many other other writing weekends and courses too, which have fed into the events of my own novels. Look no further than a group of writers, if you want to plumb the depths of emotional anguish, and numerous psychological tensions such as jealousy, euphoria, new hope, the depths of despair. I like the idea of exploring the intense relationships that develop in closed communities and certainly a week closeted together with other writers in a remote farmhouse gives plenty of fuel for such a scenario as the one I develop in Mystical Circles. Mystical Circles is out in a new edition with a new cover design on 5 September 2017. 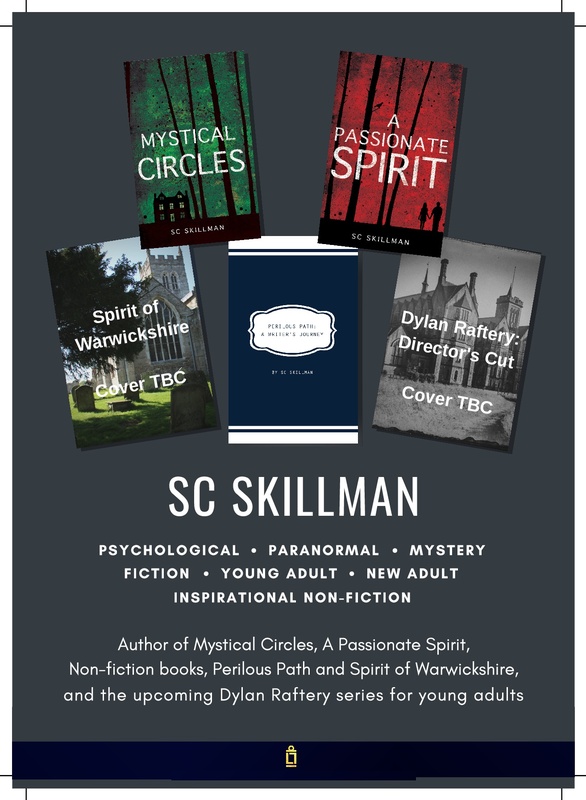 SC Skillman lives in Warwickshire, and her two thriller suspense novels Mystical Circles and A Passionate Spirit are set in the beautiful Cotswolds hills, not far from her present home. She has also written Perilous Path: A Writer’s Journey, a book of encouraging advice, tips and reminders for authors. Sheila was born and brought up in Orpington, Kent, and has loved writing stories most of her life; inspired by the adventure stories of Enid Blyton, she started writing adventure stories at the age of seven. Sheila studied English Literature at Lancaster University, and her first permanent job was as a production secretary with the BBC. Later she lived for nearly five years in Australia before returning to the UK. She has now settled in Warwick with her husband David, son Jamie and daughter Abigail. Nearby are three of England’s most famous destinations: the Royal Shakespeare Theatre at Stratford-upon Avon and the two great castles at Kenilworth and Warwick. She completed two full-length adult novels before turning to psychological suspense with Mystical Circles. Her paranormal thriller, A Passionate Spirit, inspired by Susan Howatch and Barbara Erskine, was published by Matador on 28 November 2015.